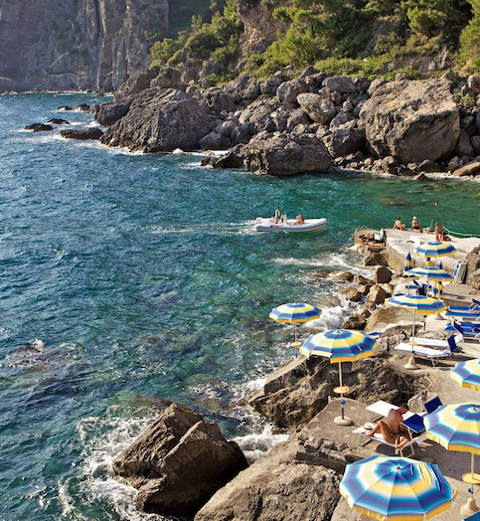 Once the home of Franco Zeffirelli, Villa Tre Ville is a private estate turned design hotel poised above the iconic Positano waterfront amongst dramatic gardens, wide open lawns and four homes that make up the current property. Once home to Russian writer Mikhail Semenov, the property was later acquired by Zifferelli who entertained the likes of Laurence Olivier, Liz Taylor and Leonard Bernstein before its current owner, Giovanni Russo revamped the property with architect Fausta Gaetani - a friend of Zeffirelli. 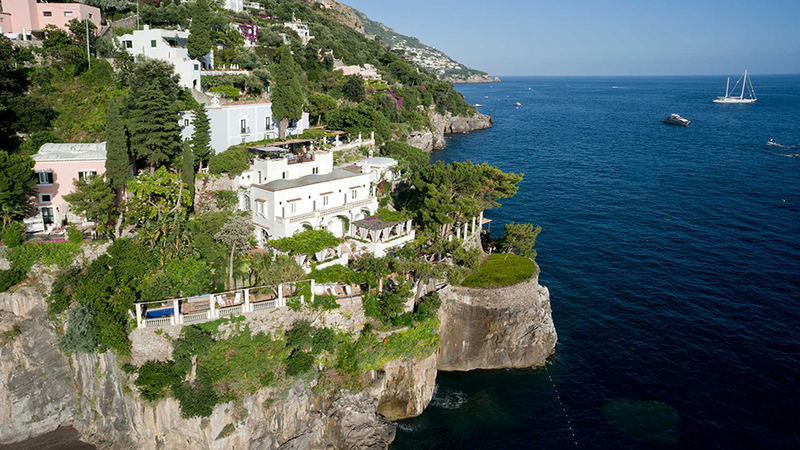 The waterfront estate offers a rare, private side to Positano that's a reprieve from what's often a crowded tourist enclave. While there's no pool, there's a waterfront jetty that offers private wooden motorboat called the San Ferninando that taxis guests to town as well as private beaches. An in-house kitchen called Pergola cooks-up a farm-to-table menu of fish caught from local fisherman and produce grown on the state from a covered terrace of indoor dining room with fireplace. Nearby, Club Lounge offers a small cocktail terrace and lounge where guests sequester to their own social clusters and spend nights over bottles of bold Tuscan wines. The property is home to 15-suites arranged within four guest buildings emblazoned in tranquil fountains of bold Italian tiling amongst picturesque gardens and vegetable pads. Interiors mix period Italian antiquities with herringbone wood or colorful tile floors juxtaposed to stark white plaster walls and windows facing the sea. Bathrooms, especially in the Bernstein Suite, wow with its capella shower that erupts in a symphonic rain shower. More traditional than the Sirenuse or Il San Pietro, the design leans on the opulent with upgraded suites like the Zefferelli offering a 2-bedroom layout with private apartment-style accommodation of dining room and grand terrace that’s perhaps one of the most dramatic accommodations on the Amalfi.